Welcome to JDS Gardening, Edinburgh’s best and most reliable landscape gardening service. We have the best prices, quality of work and a very friendly team. JDS Gardening is a well established company that has been creating and maintaining gardens throughout Edinburgh for a number of years for domestic and commercial customers, our small team of knowledgeable, motivated gardeners offers a wide range of services, from grass cutting, pruning, hedge cutting, lawn mowing, garden tidy-up's, weeding, fencing, slabbing and power washing to pointing and landscaping. We provide regular garden maintenance schedules and one-off jobs to a wide variety of happy clients. You will see from our testimonials our quality service and great value rates consistently result in an excellent customer experience. Please get in contact with us for a free quote. We don’t mind doing the little jobs that some other gardening companies might shy away from! JDS Gardening have been taking care of famous Chef "Tony Singh's" garden for the last couple of years, here he is with our M.D. Josh Dow. ​Mr & Mrs T Singh. WIN DATE: 6th November 2017. LOCATION: Edinburgh, CATEGORIES: Home and Garden. Theo says, "I admire people who have passion and energy. If you cannot bore your friends to death about your own small business then something is seriously wrong. I was struck by the number of business owners on Twitter who wanted to tell me about their new products and services. Small Business Sunday was born so that people have a specific time slot to tweet and can pitch their 'sell' directly to me". Anyone looking for a re‐tweet from Theo should tweet him about their business on Sunday between 5pm and 7.30pm and include the hashtag #SBS. Six lucky businesses are retweeted every week and then invited into the exclusive winner’s club. At the awards ceremony, Josh heard some great inspirational speeches, John Roberts- The founder of AO.com, Kypros Kyprianou- CEO of Ryman and of course Theo Paphitis. JDS Gardening M.D. 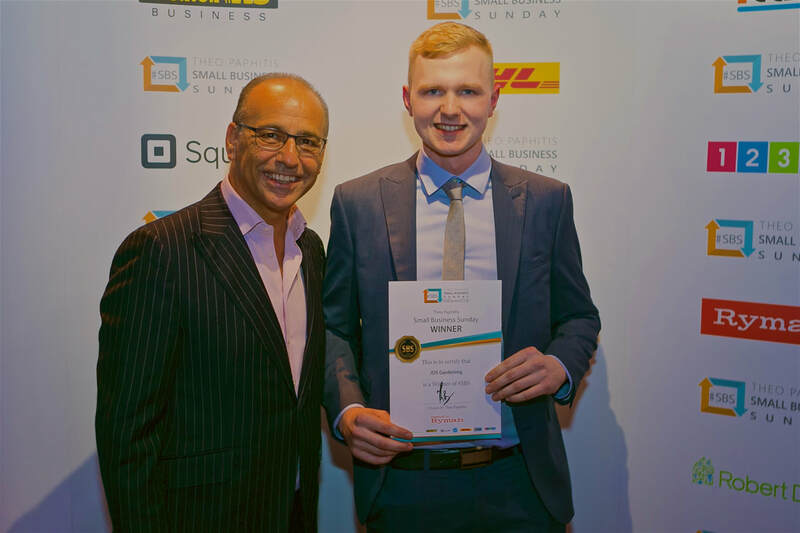 Josh Dow receiving his #SBS award from Theo Paphitis. JDS Gardening's Josh Dow Reaches Finals of Top UK Landscaping Competition! A horticultural student from the Oatridge Campus of SRUC has reached the finals of a prestigious UK-wide landscaping competition. Josh Dow has beaten off stiff competition in a regional heat and a national semi-final to reach the final of the UK WorldSkills UK Landscaping Competition, run by the Association of Professional Landscapers. Click here to read more..
JDS Gardening MD Josh Dow pictured here with Joe Swift the famous T.V. gardening presenter he was one of the judges at the UK WorldSkills Landscaping Competition at Tatton Park when Josh went through to the final.